2016 has been considered as the base year for profiling various companies in this report. For the companies, wherein information was unavailable for the base year, the year prior to it has been considered. Various secondary sources, such as such as Factiva, Hoovers, Manta, etc., have been used to understand and gain insights on the composites market. 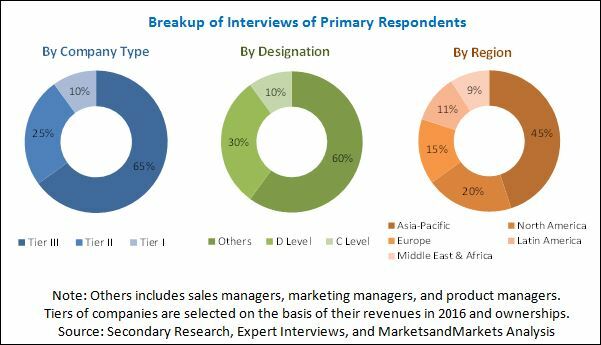 The experts from the top composite companies have been interviewed to verify and collect critical information and to assess the trends in the composites market during the forecast period. The top-down, bottom-up, and data triangulation approaches have been implemented to calculate the exact values of the overall parent and individual market sizes. The composites market has a diversified and established ecosystem of its upstream players, such as raw material suppliers and downstream stakeholders, which include manufacturers of composites, vendors of composites, end users, and government organizations. Most of the leading players in the composites market adopt backward and forward integration to strengthen their positions in the market. Owens Corning (U.S.), Teijin Limited (Japan), Toray Industries, Inc. (Japan), SGL Group (Germany), Solvay (Belgium), Hexcel Corporation (U.S.), Gurit (Switzerland), etc. are some of the leading players operating in the composites market. The composites market is projected to grow from USD 72.58 Billion in 2016 to USD 115.43 Billion by 2022, at a CAGR of 8.13% between 2017 and 2022. The growth of the composites market can be attributed to increased use of composites in the aerospace & defense and transportation applications as they offer a high strength-to-weight ratio and increased heat resistance. Moreover, they are lightweight, which increases the fuel efficiency of vehicles manufactured from composites and gives them structural stability. The composites market has been segmented based on the fiber type, resin type, manufacturing process, application, and region. 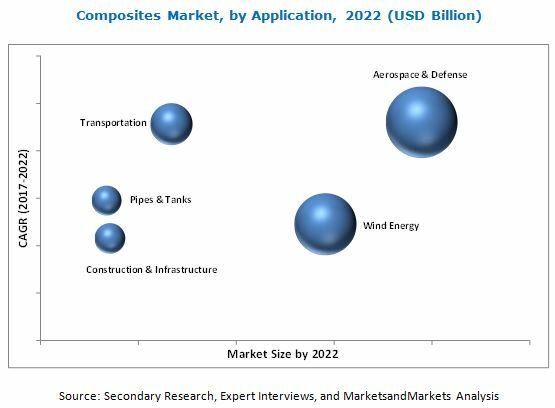 Based on the application, the composites market has been segmented into aerospace & defense, transportation, wind energy, construction & infrastructure, pipes & tanks, marine, electrical & electronics, and others. The properties offered by composites, such as increased shape stability, high strength, excellent damage resistance, and high longitudinal stiffness encourage their use in high-performance applications. Among manufacturing processes, the layup process segment led the composites market in 2016 both in terms of value as well as volume. The growth of this segment of the market can be attributed low-cost involved in the layup process used for manufacturing composites, which are mostly used in wind energy and marine applications. The Asia-Pacific region is the largest consumer of composites across the globe in terms of value and volume. The growth of the Asia-Pacific composites market is driven by the increasing consumption of composites in various applications such as wind energy, construction & infrastructure, aerospace, electrical & electronics, and automotive. The growth of the construction industry in China and Japan is driving the growth of the composites market in these countries. China has become the largest consumer of composites, globally in terms of volume and is expected to strengthen its position further during the forecast period. The growth of the China composites market is due to the establishment of a number of new carbon fiber plants in the country and increased investments in China by various Europe-based companies dealing in the aerospace, automotive, and wind energy industries. Among fiber types, the glass fiber composites segment is projected to lead the composites market in terms of value and volume during the forecast period as glass fiber composites are cheap and can be produced in bulk. Glass fiber composites are being increasingly used in the aerospace & defense, transportation, wind energy, and construction & infrastructure, applications, which has fueled the growth of the glass fiber composites segment of the composites market. Among resin types, the thermoset composites segment accounted for the largest market share in the composites market in terms of value as well as volume in 2016. The growth of this segment of the market can be attributed to increased use of thermoset composites in the construction & infrastructure, marine, and wind energy applications. Thermoset composites do not expand under high-heat and moist conditions, making them suitable for highly corrosive and high-temperature applications such as space applications. The high cost of raw materials required for manufacturing composites acts as a barrier to the growth of the composites market across the globe. However, companies across the globe are adopting various organic and inorganic strategies to build a strong foothold in the composites market. Toray Industries, Inc. (Japan), Teijin Limited (Japan) Owens Corning (U.S.), and Hexcel Corporation (U.S.) are a few major manufacturers of composites across the globe. These companies have been able to hold leading positions in the composites market by tapping various regional markets. They have undertaken expansions & investments and agreements to accommodate the increased demand for composites from various industries across the globe as well as enhance their market shares and customer bases. 13.6 Nippon Electric Glass Co. Ltd.
13.12 E. I. Du Pont Nemours & Co.
13.15 Jushi Group Co., Ltd.
*Details on Business Overview, Products Offered, Strength of product Portfolio, Business Strategy Excellence, Recent Developments might not be captured in case of unlisted companies.